First of all, life and reality is subjective by its very nature. We only ever see it from a first-person perspective. Even if you’re writing a story from an omniscient third-person perspective, then you’re still writing it for people who are seeing life from a first-person perspective. This is an extremely important thing to remember when coming up with good metaphors and similes. Like my article about writing poetry, this article will be about the subjective parts of the creative process. As such it may get slightly strange and I can’t guarantee that all of it will make sense. But, hopefully it will. Before I go any further, I should probably point out that there is often some confusion between these two terms and both are often just referred to as “metaphors”. In strictly technical grammar-fascist terms – a simile is when you say that something is similar to something else (for example: ‘The rain fell from the sky like a thousand tiny arrows’) and a metaphor is when you liken something to something else more directly (for example: ‘The rain was a thousand tiny arrows hammering on the pavement in front of me as I walked home’). Metaphors and similes are fairly similar things and, unless you’re studying English at school/college/university or you’re writing about a text in minute technical detail, then you can probably get away with using the term “metaphor” for both of them. I’ll probably use it this way in this article and I apologise in advance to any teachers, professors and/or lecturers who are reading this. Conflating these two terms seems to be one of those things which is initially seen as a corruption of the English language but is eventually accepted as part of its natural evolution many years later. Now that I’ve got all the technical stuff out of the way, I’ll get back to what I was saying – namely that it’s important to come up with good metaphors if you’re telling a story rather than using the same tired and cliched ones which you’ve heard and read thousands of times before. A good metaphor feels both totally natural and interestingly unusual at the same time. They aren’t always easy to come up with, but they tend to be at their best when they flow from your mind spontaneously. Yes, this is another contradiction but I’ll explain what I mean by this in a second…. As I said in the first paragraph of this article, we only ever see life from a first-person perspective. This influences how we write things and, more importantly, how we read things. The best metaphors are the ones which feel real – like they came directly from someone’s actual experience of the world and from someone’s mind. The fact is that we think primarily in visual and emotional terms – or at least I do. Yes, I think with words (quite a lot of them actually), but this is more like something which is overlaid over my much more basic system of thinking with pictures and emotions rather than the main part of my mind. This is like how a computer actually uses binary code, but you operate it using an operating system (eg: Windows, Linux, OS X etc…) rather than punching in lots of ones and zeroes. Pictures and emotions come first, language comes second. This is why metaphors are such powerful things. They tap into the most basic part of your mind by making you think in more visual terms. In fact, reading fiction tends to be a fairly visual/emotional experience for me in general (I’m not sure if it’s the same for everyone). In order to come up with good metaphors and similes – you have to think about things visually and emotionally when you’re writing. If this sounds slightly daunting, then don’t worry- you probably do this all the time without realising it. All you’ve got to do is to be more aware of your thoughts – just look at them and see if any interesting images, descriptions and reactions are buried in there. 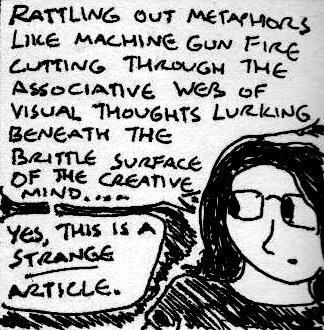 You’ll probably surprise yourself by the sheer number of interesting metaphors which are already lurking in your mind. It was the kind of afternoon which I knew all too well on so many levels – the kind of afternoon where a single nostalgic song could unlock parallel memories of the same kind of afternoon six years ago where I was feeling a different version of the same feeling, but with a different name and a different mindset. It was one of those dislocated afternoons, one of those meaningless afternoons. One of those afternoons where I feel like I’ve been pulled out of context and where I yearn for a context that I actually fit into. Back in oh-seven, I used to call those afternoons “waiting for a mission” afternoons. I’d recently read Alex Garland’s “The Beach” and I was, for a few months, obsessed with Vietnam films. This was one of those weird fascinations, one of those passing obsessions where I plunder a subject for knowledge and immerse myself in something until it’s totally drained of all it’s mystery and fascination. I’m a knowledge vampire. Anyway, that was where the metaphor came from. That scene from the beginning of “Apocalypse Now” where Willard is sitting in his hotel room and waiting for a mission from above to give his life meaning once again. It was one of those moments. Six years later. As you can see from this description, there are a whole bunch of interesting and unusual metaphors in there which could work really well in a story and there are a few which probably wouldn’t. If you write a description of your thoughts and feelings in a particular moment, then you’ll probably find a lot of interesting metaphors which actually mean something to you and which may well mean something to other people too. Ok, but I’m not writing an autobiography. How is this useful for writing fiction? Simple. Just think about your story vividly when you’re writing it. Either think of your story in purely visual terms or imagine your narrator telling you the story. My actual thought processes when I’m writing tend to fall between these two things and it’s probably slightly different for every writer and for every type of writing too. But it’s very important to immerse yourself in your story. When you’re immersed in your story, then you will be thinking with images, emotions and words rather than just with words. And, since metaphors rely on images and associations, you’ll probably find it a lot easier to come up with new and interesting ways of describing things. Your writing will go from being a detached exercise in storytelling to being something where you’re frantically trying to transcribe what is going through your mind in a way that other people can understand. When you’re doing this properly, describing things turns into a lightning-quick associative game where you are basically throwing all the vivid and visceral images in your mind onto the page. In other words, you’ll suddenly find that you’re spontaneously using a lot of metaphors and similes. Unless your mind is a fairly boring place (which needs to be enriched with lots of daydreaming, films, comics and novels), then the metaphors and similes you’ll come up with will probably be interesting and unusual ones. Congratulations 🙂 You’ve done it. You’ve found the perfect way to come up with good metaphors. No, it probably doesn’t. Until you’ve experienced this particular state of mind when you’re writing, then it probably won’t. So, how do I get into this state of mind which you’re rambling about? As I said earlier, it helps to immerse yourself in your stories or to geek out about them. It also helps if you listen to a lot of music which is appropriate to your story when you’re writing or find a way to evoke the emotions which you need in order to write properly. Keeping a dream journal, writing down your thoughts, drawing something, reading anything by Hunter S. Thompson or William S. Burroughs (both of whom tend to write about things in surreal visual ways) or watching a stand-up comedy video (since stand-up comedy relies on vivid and unusual descriptions) can also be useful ways to get into this state of mind too. Basically, whatever works for you. I think I’ve experienced that before- not making up metaphors but I’ve experienced those moments where I’m in a certain mood and these scenes and dialogues just come into my mind and I write them down without thinking- it just comes out, misspelled words and awkward grammar, but even after all that I think it’s the best writing I’ve done. Maybe it’s because I don’t think about the words or the subject. It just comes out as close as how I can imagine it and that always feels good to me. I was listening to this particular song I had on repeat a couple of days ago and I was thinking of this story idea and this scene just entered my head and I wrote it down. I’ve had those moments before, usually when I’m listening to songs that evoke some deep emotions within me.